I couldn’t resist. 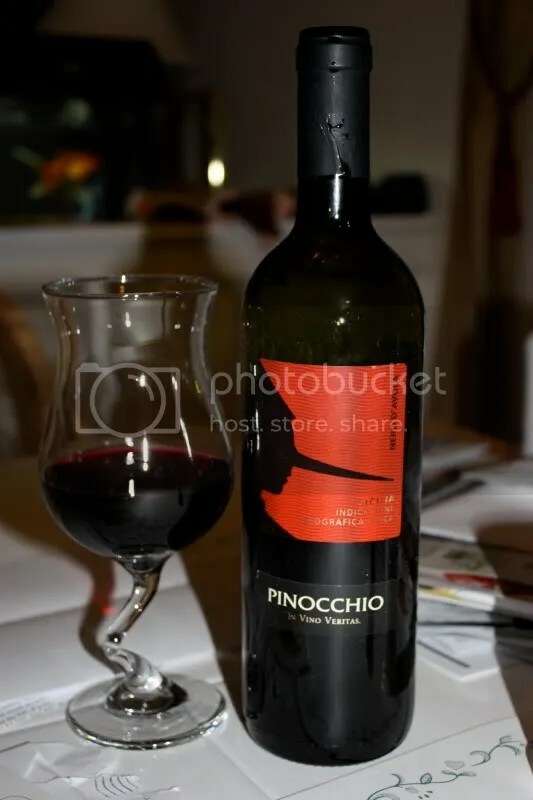 Pinocchio wine, long nose label. Yep. Cheap jokes, I love them. 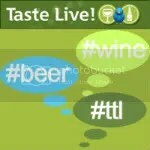 Several months ago the folks from Pasternak Imports sent a 6 pack of value wines to me and a bunch of other bloggers. However, when I was sick it was weeks where I wasn’t drinking wine and I got a bit backed up on my wine tasting, so I’m just getting around to some wines that have been chilling in the basement for a while. 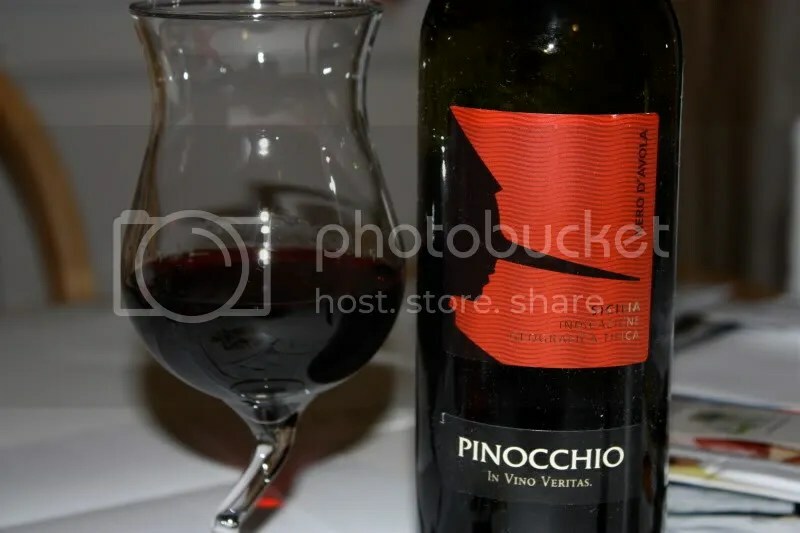 I plucked the 2008 Dievole Pinocchio Nero D’Avola from the sample bin the other night to go with an eye of the round roast. It clocked in at 13.5% alcohol by volume, had a plasticl cork closure, and retails for about $10. On the nose I found sweet raspberries, plums, sweet cherry, rhubarb, some spice, and herbs. It smelled quite a bit like strawberry rhubarb pie without the strawberries. In the mouth I got black raspberry, cherry, black cherry, strawberry, and a little spice. I found it to be jammy and smooth, I wish it had just a bit more acidity and tannic structure to it. The wine of the evening was a 2005 Sedara Nero d’Avola. It also said “Donnafugata” on the label, but I can’t say I know what that means! The wine had a real cork closure, hailed from Sicilia, and clocked in at 14% alcohol. I picked this up at the Winery in Old Town Alexandria for $15.99 minus a 10% mixed case discount. On the nose I found aromas of raisins, deli meat, and dark berries. There was a smoky note emanating from my glass as well. In the mouth, flavors of tart dark blackberries and bing cherries were present. The fruit was sour! The wine overall was mouth puckering, very dark, with a fairly long finish, and a slightly bitter aftertaste. I served the wine with turkey soup that I made out of our Thanksgiving Tom, but I think the wine was too dark for the soup. It was a heavy soup too, so I was little surprised it didn’t stand up to the wine. Overall, the wine was interesting, but I’m not sure I would get it again.